Learn how to set up your chart of accounts (asset, liability, equity, income, and expense), edit and delete them. When you start a brand new business in, it will come with a default chart of accounts already set up. If this works for you, you do not need to adjust your accounts further. If you do want to modify your chart of accounts, we recommend seeking the advice of an accounting professional. If you are looking to import your chart of accounts and their balances (trial balance) from another accounting system, please view our Importing a Trial Balance article. Lastly, if you want to know what accounts are, what they're used for, and the different types of accounts, please view our What Accounts Are and How to Use Them article. To view or modify your chart of accounts, please go to Accounts, which is found in the Setup section of the left hand navigation menu. The Number and Description fields are optional, so we leave them blank. The account can then be found in the Liabilities/Credit Card part of the Accounts page. Editing an existing account is quite simple. 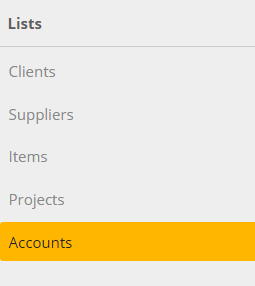 In the Accounts page, find the account you would like to edit and click on it. This is what the page for the First US Trust Credit Card account we just created looks like. As you can see, we can edit any of the fields. Just remember to click Save when you are done editing. To delete an account, go to the Accounts page, find the account you would like to remove, and click on it. From there, you will see a Remove button that will delete the account when clicked. However, you cannot delete an account if there are transactions in the account. 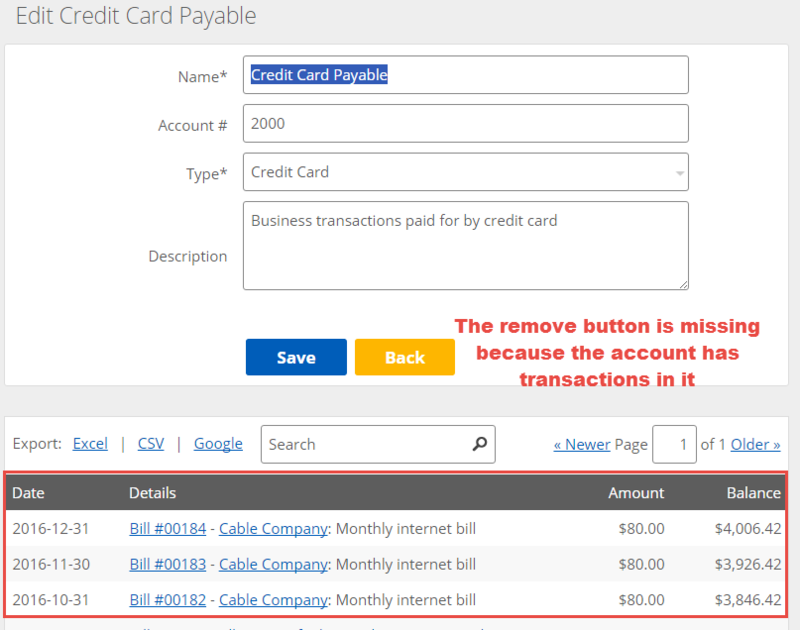 If your account has transactions in it, there will be no visible Remove button. In order to remove the account, each and every transaction needs to either be re-categorized to a different account or deleted. 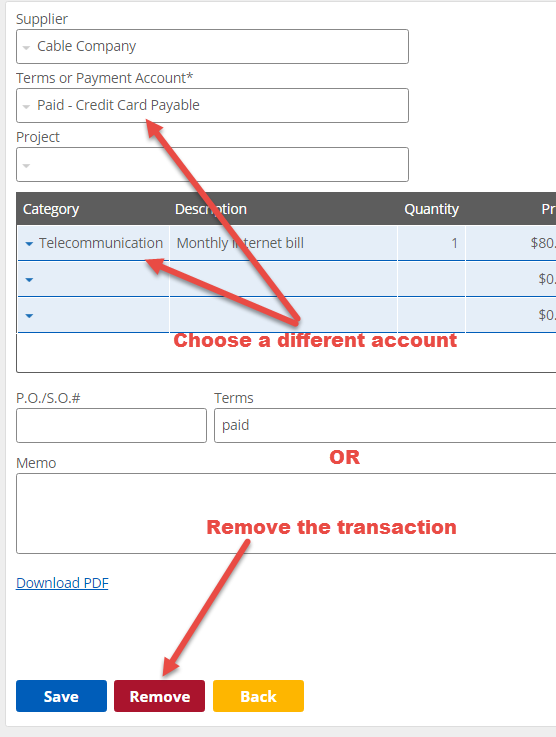 To do either, click on the transaction. If you accidentally delete an account, you do have the ability to restore it. If you can't find the account in order to restore it, you can use the search feature in the Activity page to locate the account.